We are here to serve you! With your AGCU account, you have access to other services available with us. Let us know how we can help you! Deposit Checks without leaving your desk! Never Open Your Checkbook Again! Log-in to Online Banking and click on “Bill Payment” on the left-hand side of the page. Follow the easy to follow enrollment instructions! To get started, simply download the free Mobile Banking app from the App Store or Google Play store. 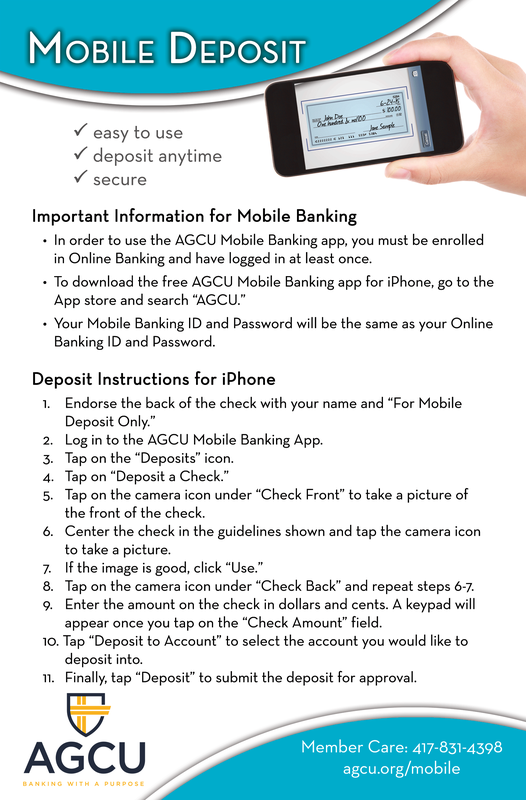 Enroll in Mobile Banking today to start enjoying all of the conveniences listed above! Contact us at (417)831-4398 or toll-free 1-866-508-2428. *Availability may be affected by your mobile device’s coverage area, operating system, and capabilities. Wireless carrier fees may apply. Deposits are subject to verification and not available for immediate withdrawal. Restrictions apply. Must be enrolled in Online Banking to use Mobile Banking service.